Landscape design has proven to be the greatest career choice for me and many of you — my colleagues! Combining ingenuity, resources and know-how with client budget and wish lists bestows each day with fun, stress, revelations, hair-pulling, elation and ultimate satisfaction. We are on-site, in office, in vehicles — often the vehicle IS the office — making decisions and creating solutions every hour of our exciting days. Being outdoors is an enviable bonus: refreshing, healthy and perfect soul food. We’ve seen a lot of advancement in this career, from sketching on napkins to the performance technology of today. Landscape design education has gone from Plant ID in night school, to three-year college programs and university degrees, with life-time support from peers, such as CNLA members. Indeed, what was once an offering by gardeners is a bustling career on its own. Perhaps the biggest struggle has been taking clients along with us on this ever-advancing path. While impressed with ideas and remedies they ‘never would have thought of,’ they further enjoy the visuals of computer assisted designs, perhaps with colour and perspective enhancements, yet many still don’t understand why they have to pay for it! Perhaps their parents and grandparents got designs for “free,” and they aren’t aware of industry advances. This is notable. While it can be initially intimidating to stand in front of potential clients and have them question your fees, we must remember our value and maintain our numbers. “There is no set formula to determine fees; you have to go out and try,” Clayton says. Your overall relationship with the client may begin or end here, and it’s as much your choice as theirs. Just as the customers are searching for the designer who is the ‘right fit,’ we must also consult with discretion. Critically, professionals who work for design/build contractors need to communicate the value of the design to every client. It’s not just about the sale of labour or getting the job. Contractors who design or employ a designer do their business and their industry a great disservice by negotiating a free plan for the contract. Sure, we know you hide the fee in the estimate, but the perception is, the time and talent that went into the plan is disposable. And that’s a giant step backwards. When executed by experts, landscape designs develop solutions to grading and slopes, existing structures and plants, neighbours, drainage, allergies, spatial problems and disagreements between the parties — to name a few. Add to that creative transitions without which the plan wouldn’t flow. But have you communicated this to your clients? We can’t forget that what comes second nature to us is a valuable commodity to others. 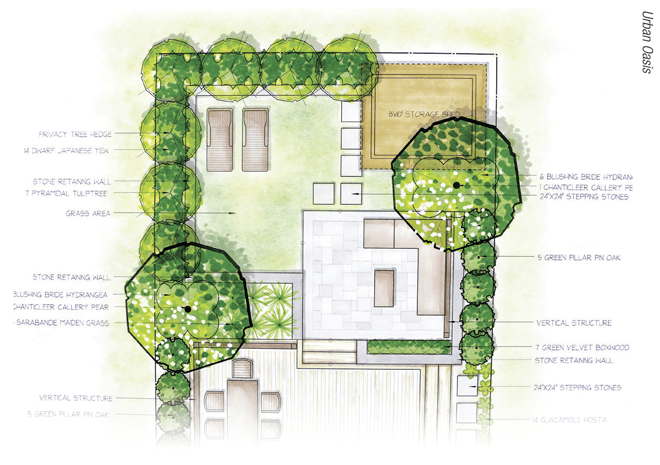 Audriana VanderWerf is an Ontario-based landscape design professional and Certified Landscape Designer.